Pokévision shows all Pokémon near user-requested locations. Redlands, California—Esri, the world’s leading developer of GIS software, announced today that Pokévision, a third-party app for the viral mobile game Pokémon Go, uses Esri’s award-winning location-based data and mapping platform ArcGIS to help players of the game find Pokémon around them. A web map powered by ArcGIS services, Pokévision shows all Pokémon near user-requested locations. 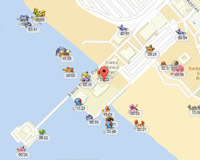 When visitors type an address or drop a pin on the map, Pokémon are displayed in real time. Pokévision helps Pokémon Go players hunt more strategically by displaying location changes and time spent in each place; the length of time in a given location depends on the rarity of the character. Pokévision had 20 million unique users in the first five days and is growing. Its peak usage exceeded 320,000 visitors with map requests reaching into the tens of millions. Pokévision developers chose Esri for its open-source, mobile-friendly interactive mapping capabilities. The developers first built the locator for a few friends, but the tool was so popular it quickly went viral. Within hours of creation, Esri experienced double the normal hit rates, and use of interactive maps used to display Pokémon rose by more than 30%. Developers can bring the Pokévision location to their apps using ArcGIS regardless of their experience in creating geospatial applications. Web, mobile, and desktop apps can incorporate the same mapping, visualization, and analysis that hundreds of thousands of organizations around the world rely on every day.